Its the Grand bunnymuff Giveaway – Day Five! There are only two days left. That means no more free patterns. I means free books of patterns! And all you have to do is answer Lumpy’s question in the comment section and you are entered to win. Last days… time for the books! The first one is From Paris, with Love. 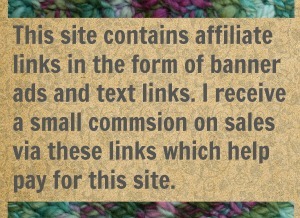 It is a romantic collection of patterns perfect for sweet gifts that will be included in GAL2015 on Ravelry. Come knit along and pop in and say, “Hi”, in the bunnymuff group! Everyone has their own views of Paris…sharing my own, I have taken motif, architecture, and design and put them to yarn. 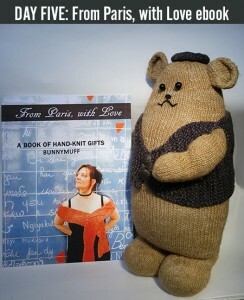 This is a book of knits intended for gifts, inspired by my time in Paris. It includes 7 easy patterns: St Jean des Briques mitts and hat, Gare du Nord shawl, Inception hat, Entrelacer scarf, Cité headband, and of course our snuggly friend, Lumpy. You are sitting on a bench by the Seine river in the shade of Notre Dame. Musicians are performing a melancholy serenade, and you are reading an oversized knitting book. The person you heart most of all walks by… what do you knit in a flash of genius to pull that person by your side? Diane B., the St. Jean des Briques mitts pattern and Cindy, the Triangle of Happiness shawl pattern! Congratulations!! Probably would have to show the finished hat of Notre Dame logo to pull that person by my side. I would quickly knit a spiderweb and use my superpowers to sling it and capture the man! I would let my yarn unravel towards him and being the gentleman he is, he would pick it up and follow it back to me. He would say, “Excusez- moi Madame. Vous avez laissé tomber ce fil.” and I would say, “What?” ‘Cuz I don’t speak French. 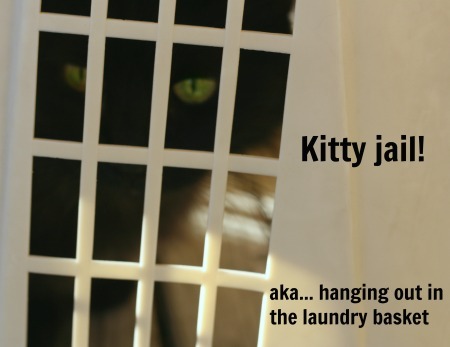 I would have been knitting a hanky to drop the next time he passed. I would knit a whip- and use it to wrap around him and drag him to me- nothing subtle here! hahha…and the naughty knitter strikes!! A lasso that would be attached at one end to the book so there would be less of chance of losing my catch.